Adam Simpson creates digital illustrations which create atmosphere through a minimalist palette and exaggerated/contradictory/flat/isometric perspectives, often with directional shadows. Moby – An architectural playlist: Electronic musician, Moby, created a list of buildings and their perfect musical accompaniment. These artworks were commissioned to accompany the eight pairings. Film Posters: Artwork commissioned by Studio Small for BAFTA. Each artwork is inspired by one of the 5 Best Film nominees in 2011: The Kings Speech, Black Swan, True Grit, Inception and The Social Network. Boundaries: A floor-to-ceiling artwork, appearing on all sides of an elevator vestibule at the ‘Boundary Hotel’, situated on Boundary Street in East London. The artwork was devised around a grid of boundary walls. Each segment is approximately 170mm square. The aim was to take an alternative approach to dealing with the seemingly dead space of an elevator interior, by immersing the visitor in an epic artwork, which is impossible to absorb in one short trip. 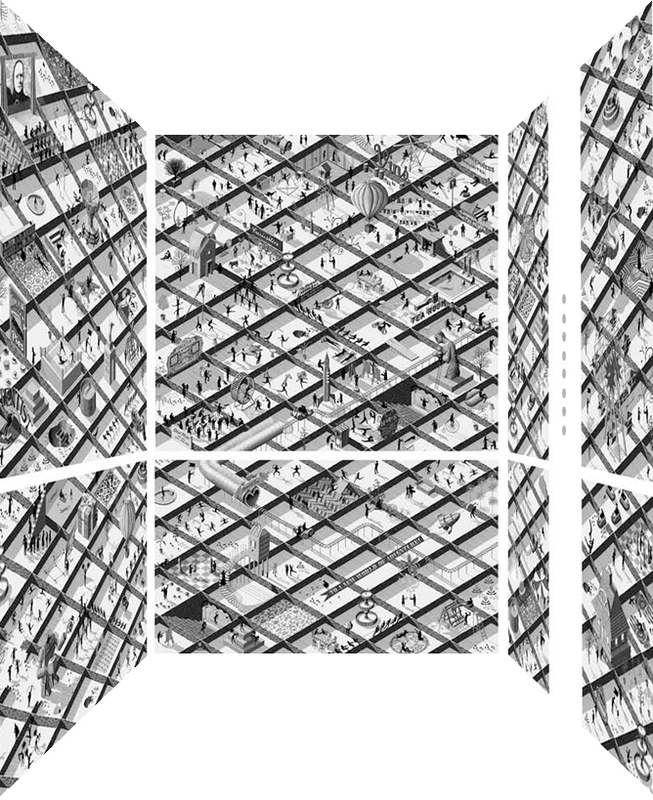 Each journey offers a chance to study a new scene: a geometric toile de jouy, of sorts. Loveth Well: Artwork inspired by the final scene of The Rime of the Ancient Mariner by Samuel Taylor Coleridge. Created for Beat.